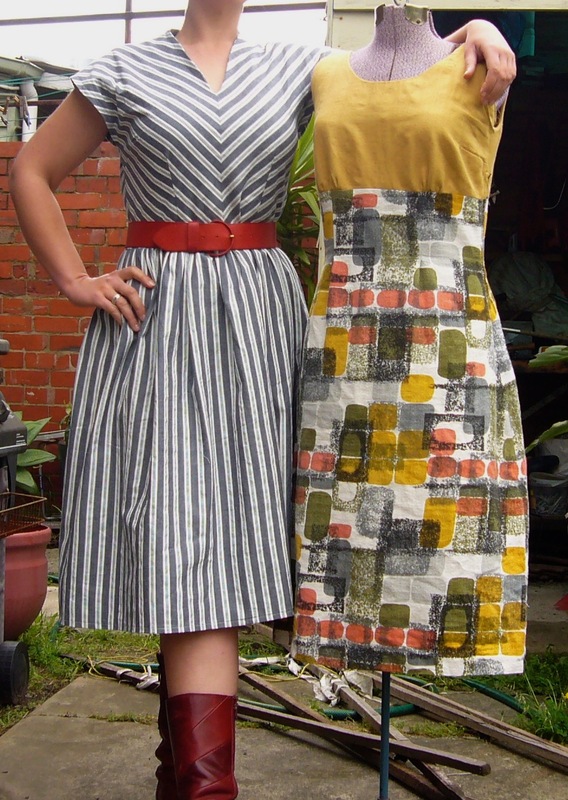 I loves me some loud, lurid and large 1970s prints for frock sewing. 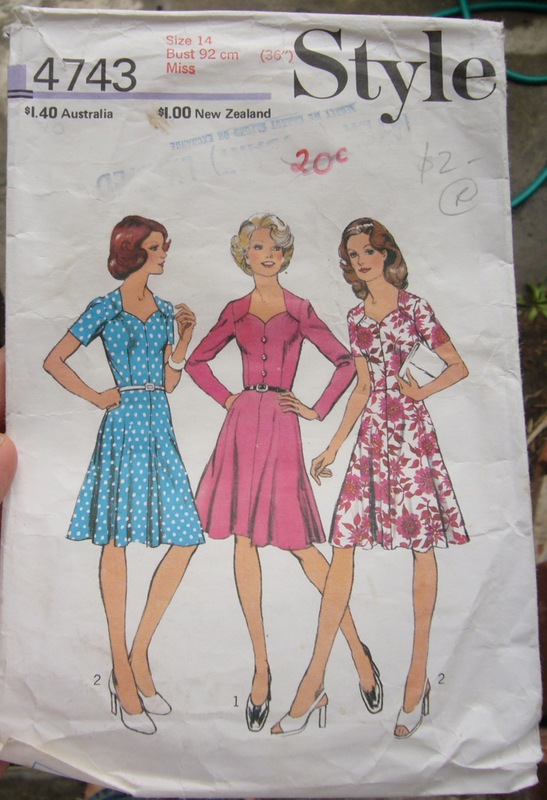 Particularly when they come from someone’s nanna’s old curtains and/or are completely untrue to the era for the pattern I choose to make ’em up in. I also loves me some frankensteining because I’m already being disrespectful in so many ways, what’s another middle finger to the pattern designer to tell them I think they I can do a better job on that skirt? Yet, I took that step. You might want to don your sunglasses roundabout now. I had two pieces, one full-width about 2m long, and a thin strip that had been tacked on to widen the curtain. Just enough for a dress If I cut carefully. I unpicked everything and gave it a wash. 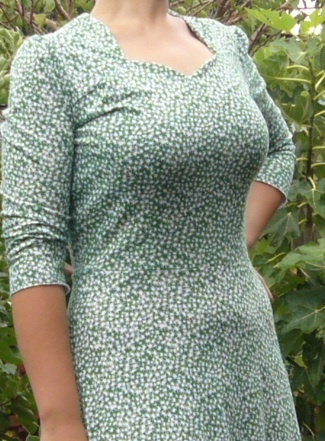 I used two patterns: the bodice was from a cheapie 1950s(?) mail-order (instructions include how to make it up for any size from 32″ to 38″ just by fudging your cutting and seam allowances. Nice.) and the skirt was pulled from a 1970s hippy-gypsy-folksy-leg-o’mutton-maxi dress. Seemed a wise choice to keep the skirt as simple as possible to really showcase the ridiculously large blotches of the print. It was a wise choice and it look smashing on Headless Esme, but what you can’t see is that I haven’t bothered sewing up the back because the skirt is too narrow. She no fit. I added a bit of width but not enough, and it kills me, because if I’d just flared out an extra inch either side, she’d be apples. WOE! To the Pile of Shame you go, frock. ‘Sbeen awhile but I haven’t been entirely idle, sewing-wise. 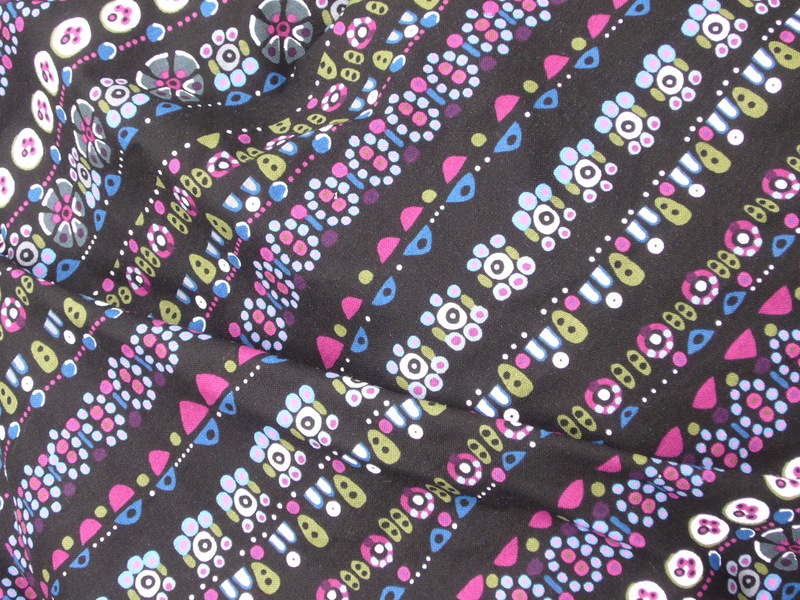 I had a very positive Spoonflower experience… their service is super-speedy and the printing quality was ace. If I use them again I’ll cough up for the better-quality fabric though.. the quilting cotton is a bit thin and scratchy for clothing. I’ve also been sewing for money which is NEVER worth it. It feels like homework and the money is crap. Don’t bother. You can tell which one’s Esme because she’s got thinner legs. She’s wearing a version of the Pinstriped Pinny pattern made from gorgeous old barkcloth with a modern barkcloth remnant for the bodice. Looks great on Esme but on me, the mustard yellow is just a bit too similar to my skin tone, plus it looks like I’ve been reassembled from two different bodies. Add to that the sad tear in the back of the skirt where the light damage to the old barkcloth curtain was more serious than I thought. Beyond fixing, methinks. I’m wearing a (wearable? 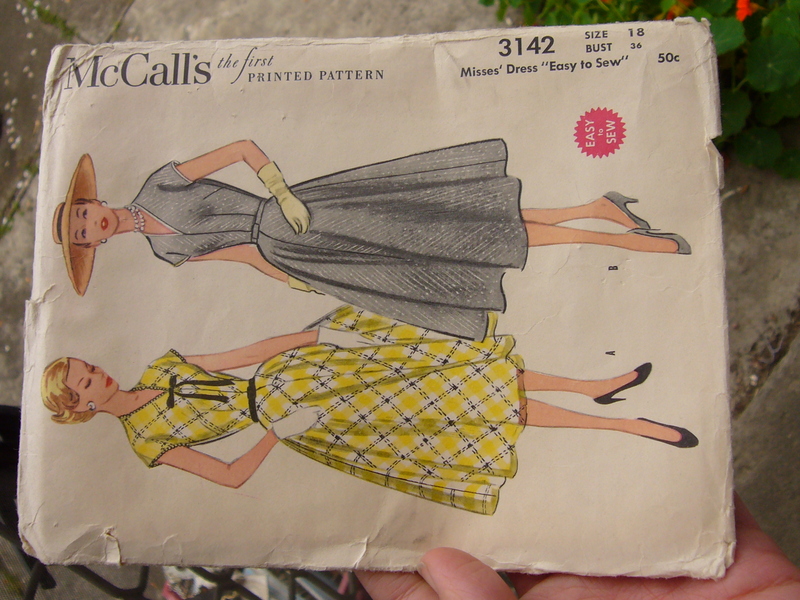 I’m not sure) muslin for a 1955 McCalls pattern I’ve had for ages. You’re going to have to live with it sideways, I’m afraid. …which I’ll have to find something else to do with. Ah well. Occasional mediocrity is OK. 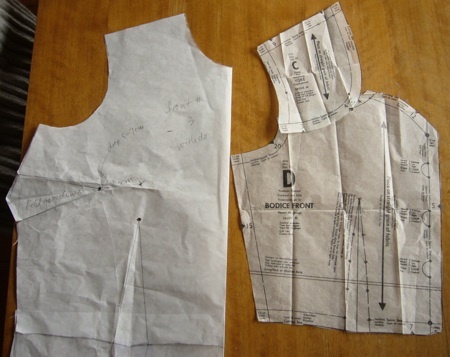 This is NOT a close-fitted bodice. I could store a spare tyre or seven in here. 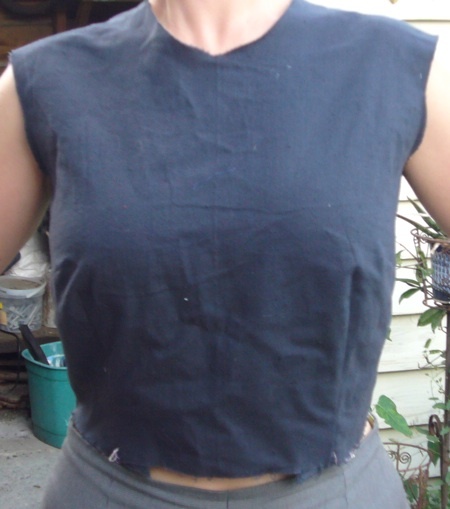 I’m feeling a bit hang-dog that this is my third bodice and they’re getting worse! I can’t understand where all this extra room came from, since it certainly wasn’t in its predecessor. Bah. I’m supposed to test out my sleeve pattern now, but it seems pointless when (desperately-needed) changes to the bodice will demand changes to the sleeve. Most frustrating is that I have two classes left – not time to fix this, check sleeve, and draft skirt. Grrr. We’ll start this post with the good news, shall we? 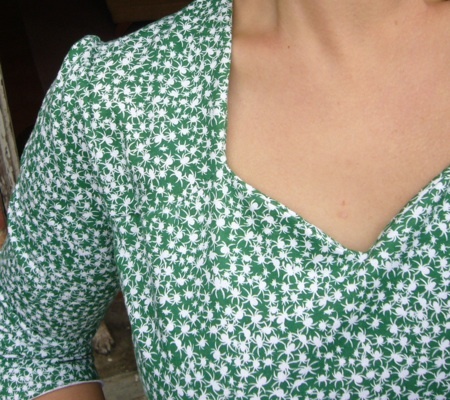 That is, I used my custom pattern – the one that is exactly the right length for me – to adjust a commercial pattern. 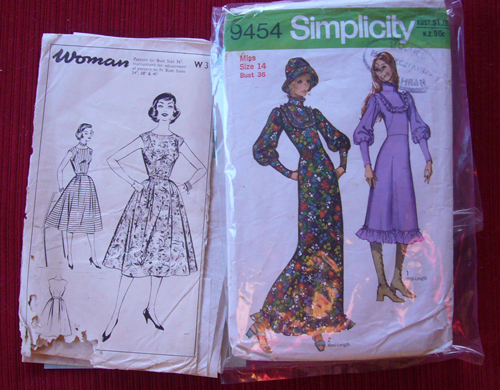 Commercial pattern (circa 1974 pattern, Style 4743) on the right is about 4cm too short. So I lengthened it. Hurrah. Simple. You’ll note too that the commercial pattern has smaller and fewer darts. I wasn’t worried about this because I was going to cheat and make it from cotton jersey – you can get away with a lot thanks to the stretch. Cute pattern, right? Kinda kicky 1970s-does-1940s, right? Oh my lord, this came out as the frumpiest Texan Polygamist Compound dress ever. I’m embarassed to post it, but here ’tis. …but I think the fabric is a big part of the problem. Bleh.